I made this cornbread to take to our family New Year's gathering at my mothers. It's really moist and of course has a kick to it! My brother loved it and took home the leftovers. Here is a recipe worth sharing! Mix all ingredients. Bake 45 minutes at 375 degrees or until a toothpick comes out clean. Tip: I used buttermilk and I added just a few green chilies. This is a delicious recipe my brother, Steve, makes and it's a Sloppy Joe like no other! I hope I can make this as delicious as he does!! Cook meat, onion, celery and green pepper until done. Darin and add next nine ingredients. Mix well. Simmer for 34-40 minutes. Serve on buns. Makes 8-10 servings. I finally found it!! .....okay, to be honest my sister-in-law, Kim, found it. A Red Velvet Cake that isn't dry. This one is the perfect cake with the perfect icing. 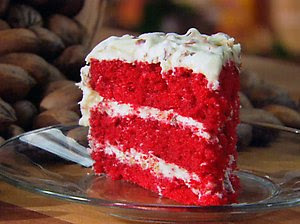 I had given up trying to bake a red velvet cake because I couldn't find a recipe that was really good. Thank you for sharing, Kim! Preheat oven to 350 degrees. Lightly oil and flour 3 (9 x 1-1/2-inch) cake pans. In large bowl, sift together flour, sugar, baking soda, salt, and cocoa powder. In another large bowl, whisk together the oil, buttermilk, eggs, food coloring, vinegar, and vanilla. Divide the cake batter evenly among the prepared cake pans. Place the pans in oven evenly spaced apart. Bake, rotating the pans halfway through the cooking, until the cake pulls away from the side of the pans, and a toothpick in the center comes out clean, about 30 minutes. When frosting the cake, spread 1/4 to 1/2-inch of the frosting between layers. Cover the entire cake with frosting. Optional: sprinkle with pecans. With mixer, mix the cream cheese, sugar, and butter on low speed until incorporated. Increase the speed to high, and mix until light and fluffy, about 5 minutes. Reduce the speed to low and add the vanilla, raise the speed to high and mix briefly until fluffy. Store in refrigerator until somewhat stiff, before using. Lindy brought these when we celebrated Mary Ann's 50th birthday!! They didn't last long because they're so delicious! Mix all ingredients, spread thinly on tortillas and roll up. Cut into rounds. They are much easier to cut if you roll them up and let them sit in the fridge for a while before you cut them. Mexican version: Leave off the bacon and ranch dressing mix, instead add green chilies, sliced black olives and 1 teaspoon of taco seasoning. This dip, from my friend Vicki, is a delicious mixture of flavors. It's really hard to make yourself stop eating it. A great easy to make appetizer! Okay ladies, this is the coffee cake I made for Janet's 20th anniversary! Many of you asked for the recipe and here it is......easier than pie! Mix first 5 ingredients and pour in 13X9 inch ungreased baking dish. Mix brown sugar and cinnamon and sprinkle over cake. Mix and swirl this into the cake batter with a knife. Bake 1 hour at 300 degrees. Beat powdered sugar and melted margarine together. Add milk until you have a glaze consistency. Pour over cake when done, but slightly warm.